Woohoo! This inspiration board was so fun to make! 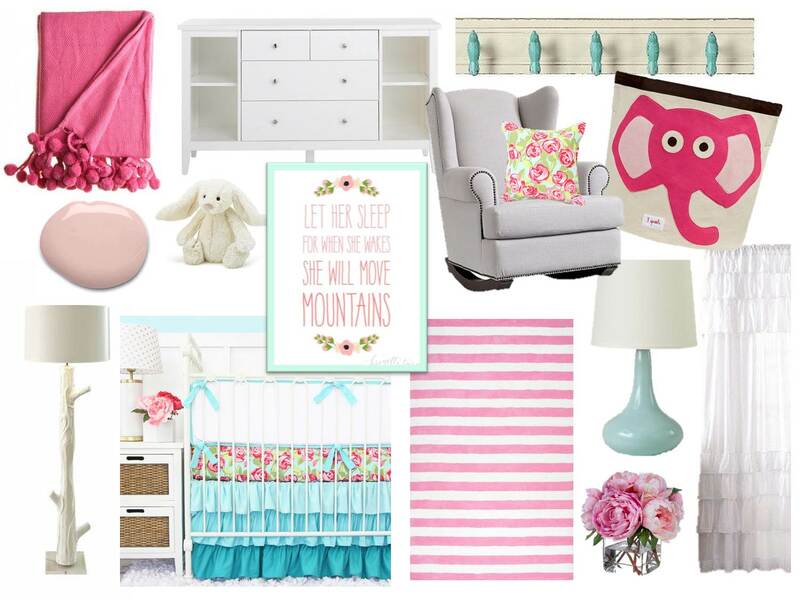 I think this bedding set + colorful accents would make such a bright and fun nursery for any little girl! I hope these items inspire you in some way – I mixed and matched items from several different stores to create a cool assortment of funky and girly! Below are all of the items and where to purchase them. Pink Throw – Would be perfect thrown over the rocker! White Changing Table – You could always do a DIY version of this to save money! Wall Color – Rosy Outlook SW 6316 is the perfect pink for this room – not too matchy matchy and calms the other colors down a bit! Cream Bunny – I always love to include a Jellycat stuffed animal in each room to add a keepsake that looks cute too! Art Print – Downloadable art is such a cost efficient way to add unique artwork in a room. Purchase, print at home or Staples, put in a frame (you can always spray paint a frame or matte to make it match even more) and there you have it – a piece that looks super expensive! Rocker – I feel like a rocker is something you can splurge on because it will get so much use and can be used for multiple children. Elephant Storage – This proves storage can be cute too! Faux Tree Floor Lamp – Another item that could be a possible DIY project if you don’t want to spend a lot of money! Bedding Set, Pillow, and Changing Pad Cover – The prints and pieces that tie the whole room together! Pink and White Rug – This website has AWESOME sales all of the time. Ceramic Lamp – Would be perfect on a DIY side table by the rocker. Flower Arrangement – This item is pricey but is the exact look I wanted for this board… You could find a less expensive version of this at Homegoods, TJMaxx, or Target. White Ruffle Curtains – I love anything with ruffles and think the white would look great in front of the pink wall! I hope you have enjoyed this design! Remember – You can always purchase your must have items first and find less expensive versions of the rest of the items after. DIY projects are always fun too! There is always a way to create the look you want with any budget – it just may take some extra planning and work! I’m thinking my next post will have to be something involving my recent obsession with ARROWS! I will try to post again later this week! As I found more and more products I kept a running budget list. I switched out expensive items for less expensive items when needed! I was able to do some awesome DIY projects (I will post some of those later on) that really helped budget wise while still creating the same look and feel of what I wanted. After finding most of the items online, I began to slowly purchase them and begin the nursery (starting with the items I loved most). After several months of hard work, the nursery was done! Below is the final product! Pictures by Cassandra Bursey Photography. 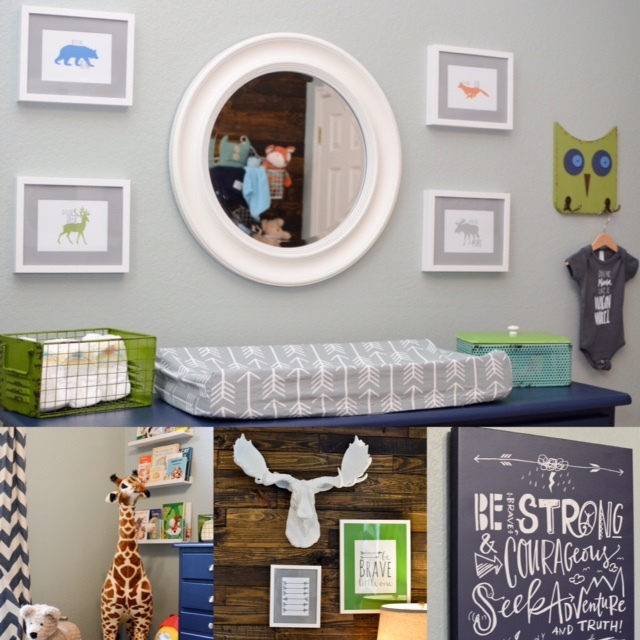 I was very happy with how Bowen’s room turned out! 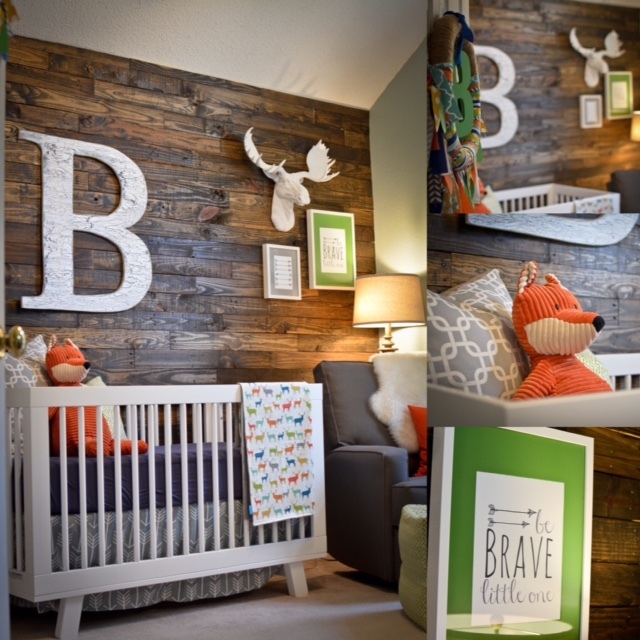 The reclaimed wood accent wall, bright colors, and woodland elements create a fun, unique space for him that he can enjoy for a long time. I think it will also be easy transitioning it into a big boy room one day unless of course I decide to redecorate completely. Haha. Below are the details of my project! Please let me know if you have any questions, comments, or would like to see any tutorials for the DIY projects on the blog! Hello Everyone! Welcome to my blog – I hope to inspire you with my favorite products, decorating ideas, do it yourself projects, and organizing tips! Because I have an obsession with making room idea collages and searching out the newest decor everywhere I thought I would start a blog and share it with you guys! I am from a small town in Texas. I graduated from the University of North Texas in 2010 and soon after opened up a baby boutique in my hometown. I had my boutique for 5 years and when my son was born in January I decided to take the store online only so that I could work from home with him. It has been going great so far and I feel like I have the time now to pursue this blog that I have been wanting to start for so long! To learn more about me, visit my About Me section. I will try to start posting at least once a week and hopefully more than that if I can find the time! Look out for a blog post at the start of next week. 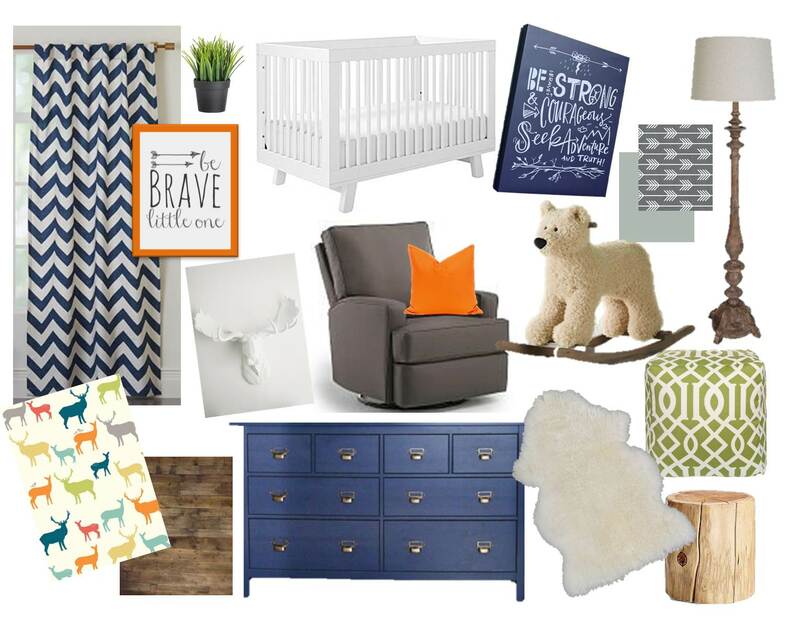 I plan to start with my son’s nursery, which is what inspired me to start this blog. I will show you my design process and then the final product along with links to all of the products used in the room. I hope it inspires you to search out all different stores and price points to find the perfect pieces for your projects! I feel like that might be helpful for those about to start a design project. It worked for me, and made the process so much fun!